All mixing services are provided by DJ Voice aka SL Hadbai who has recently remixed "The Future" for Kickin' Records (unreleased). We offer several remix music services. REMIXES. 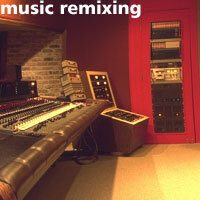 We can remix any track which you give to us, be it a popular track or one of your own. It helps if you give us the song split into tracks, but we can nevertheless remix songs where this is not the case. If the song is not split into tracks it just makes our job more difficult, and also limits the possiblities of what to do with the remix. The song must be on CD for maximum quality. Maybe you've got permission to remix a track and the money for the licence, but want somebody else to do the hard work, so you can cash in on the charts! We can also remix songs played by human musicians, not only dance hits with computer generated drums. Basically we'll "dehumanize" the track, and make its rhythm as precise as a computer generated rhythm. We can also speed up tracks by upto one third without any noticeable reduction in quality or change of pitch. In most cases the remix will have new drums and will also be remastered. I have remixed several tracks, including a Garage mix of MI:2 (by Limp Bizkit), Say (by the Corrs) and When The World Is Running Down (by the Police) - which just need permission to be released, but are ready to be sold, if you'd like to buy the rights to them. You still need the record companies' permission. MIX COMPILATION. We can make mix compilations of any dance songs, which you send us on CD! Maybe you're a budding DJ who wants a perfect quality mix CD for original songs to sell. Or perhaps you want to sell an exclusive dance compilation. Using special timestretching technology we can beatmatch tracks without any loss of quality or change of pitch. Also there will be 0% errors, since we preview all cross fades between tracks. In addition we can add rewinds, just like with turntables. All this is done digitally using a computer, so the finished article will be virtually perfect! MASTERING. If you're looking to master your CD of songs, we can do it. We'll normalise it, balance all the frequencies and can take requests, such as "make the drums punchier" or "more bass". FOR LEGAL REASONS, YOU MUST HAVE PERMISSION FROM THE RESPECTIVE RECORD COMPANIES BEFORE YOU ASK US TO MAKE A MIX COMPILATION OR REMIX! YOU MUST DO THIS. WE WILL NOT BE RESPONSIBLE FOR ANY LEGAL ACTION TAKEN AGAINST YOU, IF YOU HAVE NOT DONE THIS. PRICES. Each task is priced individually and is dependant on how many tracks are to be remixed. In some cases we may require a small lump sum and also a few percent commision on any sales of either the remix or the mix compilation. ONE LAST THING. For the remixes and mix compilations it helps us greatly if you can give us an the accurate speed in BPM of the songs. You can contact our remixing team.